Posted By Carlos On March 15th 2017. 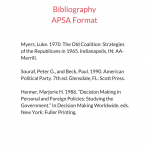 Under Annotated Bibliography Tips Tags: apsa bibliography generator, apsa citation style, apsa format . Political science as a study entails social sciences that can be related more to history and anthropology as compared to chemistry and biology. It, therefore, makes a lot of references to scholarly works especially on history and anthropology and this comes with a lot of referencing as well. Referencing is important since it ascertains to the reader that certain material in your work came from another source. This way, anybody won’t claim that your work has been plagiarized and they will be able to appreciate the source of your ideas and information. Vancouver bibliography generator tips and advice from experts are here! APSA citation style is also specific and applies only for this particular field just like mechanics, electrical engineers and medical doctors have their own guides that dictate their reference and citation style. There is a particular set of guidelines that should be adhered to according to this citation style. Some helpful tips that will assist you in coming up a reference list according to the guidelines for APSA format are listed below. While making the citation, make sure to include only the last name of the author(s). You could use initials for the other names. Alongside the name, you should also include the year of publication for the works from where you have made citation as well as the exact page and chapter of the citation. The year should be put in parentheses. All the works cited should appear in the reference list at the end of the article and this includes notes, tables and figures. You should follow a chronological order while writing all the citations by authors. This is by indicating a sequence of authors whose works form a progression of ideas through time in the text, rather than using a parenthetical citation. When two or more authors are involved, make sure to mention all names each time you are making a reference. In the case where more than one study is cited, you should arrange the references in alphabetical order and then separate them using semicolons or semicolons and commas. The reference list begins on a new page and it is titled “References”. Make sure that you double space all lines and use hanging indentations. Use authors’ last names, first names as well as the initial names if they are available. For books you should use “et al” to credit fourth through last authors. Abbreviations that are used quite often such as dept. could be used in parentheses and tight matter. There are particular scholarly abbreviations such as e.g. and i.e. which may be used in the text. A comma is often used to separate the year from the page number or chapter number. Multiple works done by the same author must be arranged chronologically by the publication date. The author’s name is repeated at the beginning of each reference. Except for the title page, all page numbers should be centered in the footer. For the title page, it should contain several elements: the title, the author’s name, the name of the class as well as the date of submission. Our experts have handled all types of bibliographies for quite a while now and therefore you can trust them to come up with help advice with regards to coming up with a perfect piece done in APSA citation style. According to them, it is advisable to know the definition of this style and the guidelines used in writing it. Our APSA bibliography generator has an in-built system that takes care of all these guidelines. 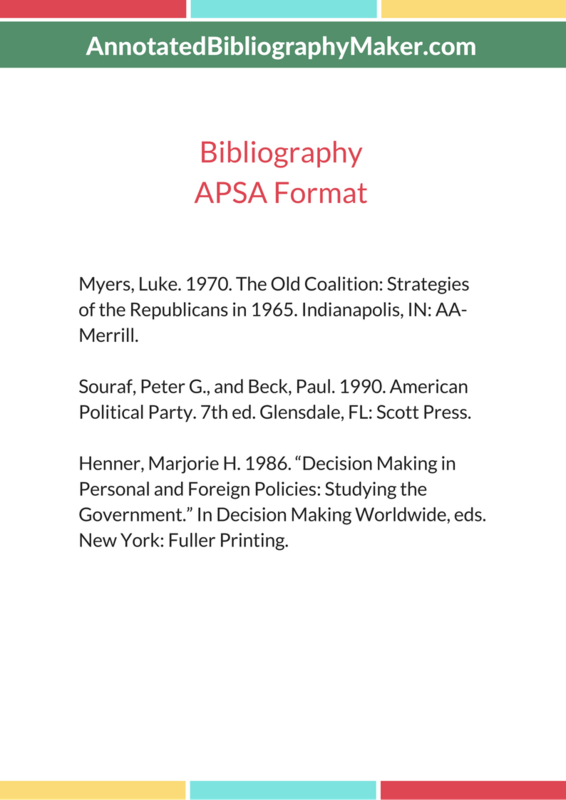 Our APSA bibliography generator is quite helpful since it comes in handy by helping you generate an exemplary bibliography in this particular citation style. So, if you still in doubts who can do bibliography for me, don’t hesitate to ask our professionals! Our service been used over the years and you can trust us for credible output. The generator is quite fast as well as efficient and it only takes a few seconds for it to come up with the bibliography and present the output. You do not need to revise the bibliography since it conforms to APSA citation style and it is free of all errors and flaws since it has been proofread a couple of times before being presented to you.